Montpelier City Hall is located at 39 Main Street, Montpelier VT 05602; phone: 802-223-9500. Photo: 1971 reconstruction of the ca. 1876 Pavilion Hotel. Contains working offices for the Governor of Vermont, situated with a view of the State House. Photo by username: gearedbull, 2007, commons.wikimedia.org, accessed September, 2012. Although little is known of the earliest settlement of the area by Native Americans, we do know that about 6,000 years ago, warm, dry weather blossomed the spread of population into the upper Winooski River Valley. By the year 1200, extensive settlements developed throughout the region and were linked by trading networks. The rich flood plains and relatively warm southern exposures were conducive to settlement. After the arrival of European settlers between 1600 and 1800, war, disease, and dispersal virtually destroyed Native American settlement. However, early investigators in the mid-1800's reported burial mounds and other evidence of Native Americans. Otherwise, material evidence is limited to three recorded sites in the Vermont Archeological Inventory. All of these were random, chance finds of stone tools and spear points. This lack of evidence is probably due to intensive development in highly sensitive areas and past flooding which wiped out remains. In contrast to prehistoric archaeology, historic archaeology is well documented. The earliest settlement lies west of the North Branch River along Elm Street, where Colonel Davis built a log cabin in 1787 or 1788. Although much of earliest Montpelier has been replaced, significant evidence of our early settlement remains, much of it buried and waiting to be discovered. Montpelier was originally chartered in 1781 as a grant to settlers from Massachusetts. The first settlement was established along the North Branch in 1787, during the time Vermont was an independent republic. Original grantors envisioned the main portion of the town growing on high ground around Montpelier Center, but the availability of transportation routes and mill sites attracted early settlement along the riverbanks. By the time statehood was achieved, and the settlement was organized as a town, Montpelier had a population of 113. The early years of the community saw rapid growth with an influx of settlers who built saw and grist mills, roads, schools, churches and inns. By 1805 the town had a population of 1,200. In that year the State Legislature sought a permanent home. Montpelier was selected because of its central location, and the support from local residents who provided land and money. A humble statehouse was constructed on State Street. This first legislative home was replaced in 1836 by a statehouse designed by Ammi B. Young, largely at the community's expense. This granite structure was gutted by fire in 1857. The present state house, designed by Thomas Silloway, was constructed on the same site in 1859. In 1811, the growing town was selected to serve as shire town for Washington County. In 1828, the financial service sector was established by the Vermont Mutual Fire Insurance Company. In 1848, the National Life Insurance Company was established, followed by the Union Mutual Fire Insurance Company. Also by the mid-1800's, the railroad arrived which stimulated the business of the town. Thus, by the mid-nineteenth century, the principal economic components of the community, which continue to this day, were firmly established. The configuration of the early village was strongly influenced by geography. As early as 1799, a bridge was constructed across the Winooski to Berlin. By 1858, the form of the main streets paralleling the rivers was developed. The downtown street pattern has changed very little since that time. In 1849, Montpelier Village separated from the rest of the town, which was reorganized as East Montpelier. 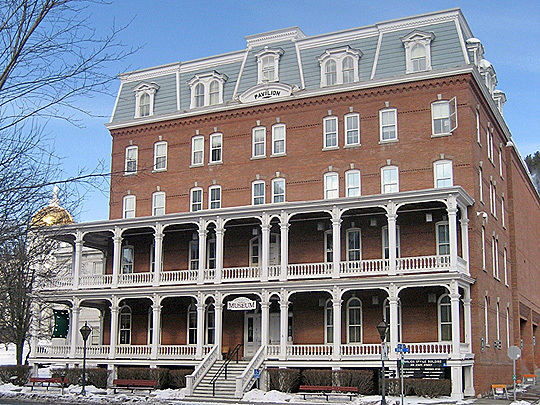 After the Civil War, the antecedent of Vermont college moved to Montpelier from Newbury, Vermont, and became known as Montpelier Seminary. In 1936, it became Vermont Junior College, and in 1953 it was converted to Vermont College for Women. In 1972, the college was acquired by Norwich University. As the bottom lands along the rivers became developed, homes were established along the surrounding hillsides, frequently on land claimed from the incredibly steep slopes. Several natural disasters figure prominently in the development of the City. In 1875, a large fire destroyed many downtown buildings. In 1927, a great flood brought twelve feet of water at State and Main Streets and did great damage. Nearly all bridges connecting the banks of the North Branch and Winooski rivers were replaced after the flood. Many of these steel truss bridges are now considered landmarks in the community. A view of Montpelier in 1883, shows a compact village with many features which exist today — the State House, County Courthouse, the Pavilion Hotel, many churches and the retail buildings of downtown. The view indicates that stone working was established in the town, as were tanneries and other small manufactories. By 1925, nine granite works were established in the City to refine stone from the famous quarries in Barre. In 1895, Montpelier reorganized as a city. In 1898, the northern portion of the Town of Berlin on the southern bank of the Winooski chose to be annexed, and the present form of the city became established. At that time, what we now call Berlin Street was in actually in the town of Berlin and the Berlin Opera House was located near School Avenue. In 1899, the City was given 134 acres of land by John E. Hubbard for use as a park. In 1911, additional land was donated where the present Hubbard Park tower stands. The park was expanded to its present size through a donation of 50 acres in 1991 by the Heney family. The city grew slowly in the late nineteenth and early twentieth century during the period of intensive out-migration from the state to new lands in the West, or to industrial centers elsewhere in New England. Montpelier was already established as a government, market, service and industrial center in the region. When the automobile arrived, new state highways were routed to the city limits, and traffic then circulated through the original streets. In 1954, a new bridge was constructed at Bailey Avenue which linked to an extension of Winooski Avenue, now Memorial Drive, and diverted some of the traffic from the downtown area. Remarkably, Montpelier's residential population has been stable at a little over 8,000 residents for the past 60 years. This is a significant factor in explaining why Montpelier has maintained its small and friendly character, making it the spacial community we cherish as a place to live, work, and raise our families. However, during the same period, the number of people employed in Montpelier has grown from 3,800 in 1940 to about 9,000 in 1999. This influx of commuters who come to work in Montpelier is a significant factor in explaining the changing character of the city, bringing increased traffic congestion and increased demand for parking and housing. At the same time, Montpelier's role as a regional center for arts and entertainment continues to evolve. We have attracted many new restaurants to our community that are heavily patronized by our daytime workforce and many people from the surrounding communities into the evening hours. This has enriched the vitality of the downtown area. Montpelier Vermont Planning Commission, Master Plan 2005, Montpelier VT, www.montpelier-vt.org, accessed January 2008.